Port Lavaca Amateur Radio Club, Inc.
Thursday, March 14 at 7:00 p.m. The program will be announced. Please check your e-mail. Of course, the open exchange of recent amateur radio experiences is always encouraged. MARK YOUR CALENDAR TO JOIN US! To join the PLARC e-mail list, send your request to campbell@waltereden.com. 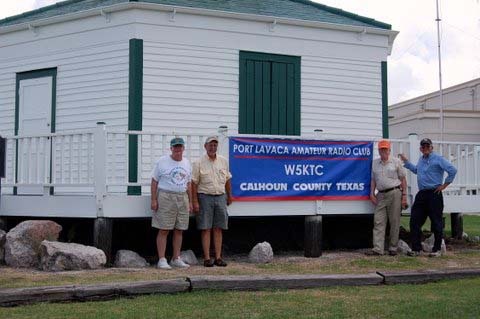 The Port Lavaca Amateur Radio Club (club and repeater call W5KTC) is active on VHF, UHF, and HF.The club meets every second Thursday of the month in the 1st floor meeting room at the (Calhoun County) Memorial Medical Center, 815 North Virginia Street. In addition to following their own interests, Club members provide valuable services to the community during disasters. W5KTC is headquartered in the Calhoun County Courthouse (Grid EL18QO) and members report directly to the ARES&REG; EC, County Emergency Coordinator and the County Judge. Find out more about who our members are, their interests and experience at MEMBERS. Provide emergency communications to Port Lavaca and Calhoun County officials, as needed, in the event of natural or man-made disasters. Encourage individuals in obtaining an FCC amateur radio license by sponsoring classes and volunteer examiner testing sessions. Promote the exchange of information and cooperation between members, further radio communications knowledge, techniques, fraternalism and individual operating efficiency, and conduct club programs and activities so as to advance the general interest and welfare of Amateur Radio in the community. Copyright 2011-19, Port Lavaca Amateur Radio Club, Inc.